64 Ad: Rome is in turmoil - the city has been devastated by fire. Emperor Nero is racing back from Antium to start rebuilding Structures lost to the flames. Caesar expects your aid in his historic effort to restore Glory To Rome. 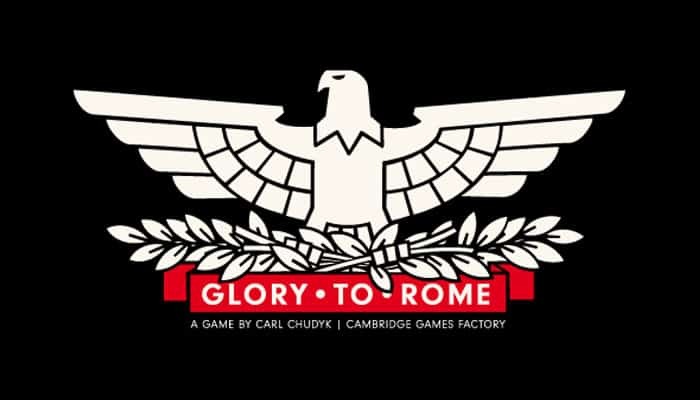 In Glory To Rome you play a young Patrician hoping to gain Influence and fortune by helping to rebuild Rome after the great fire of 64 AD. 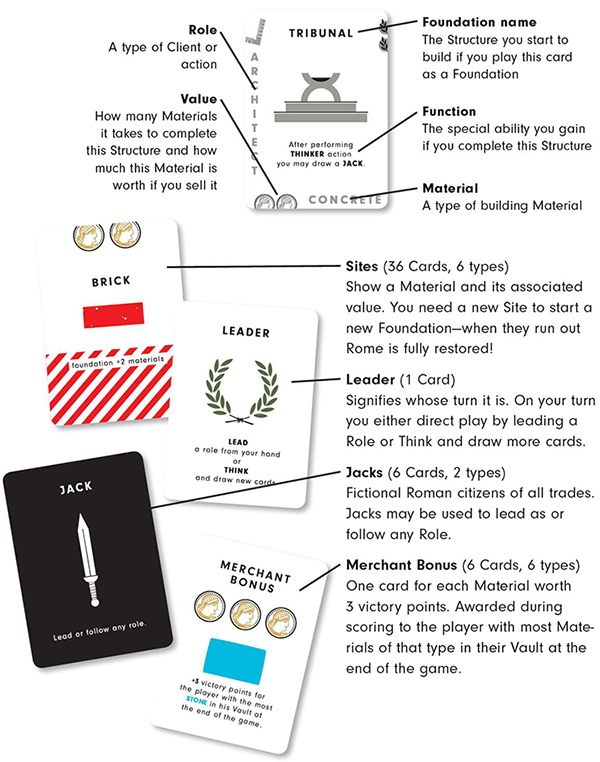 The object of the game is to gain wealth and power (Victory Points) by both completing Structures for Emperor Nero and selling the building materials for your personal gain! During the game you hire Clients and gather Materials to help rebuild Rome (or your personal fortune). Your Camp card organizes your Clients and Materials, and also tracks your growing Influence. Glory To Rome takes a little getting used to. The core game manages 5 different card states (role, person, material, money, building) with six different action types and a role based phase order which will probably trip you up for your first few rounds. On top of that you have forty different building powers which have a huge Influence on the game. While no single card is a 'Must Build', many combinations are extremely powerful. From your very first turns you will be presented with deep strategic choices influencing the entire character of the game, but until you have a good understanding of the core game mechanics and some insight into how the various building powers are capable of changing them, you're really not at all equipped to make these decisions. 'Let's just start' does NOT work well for this game! 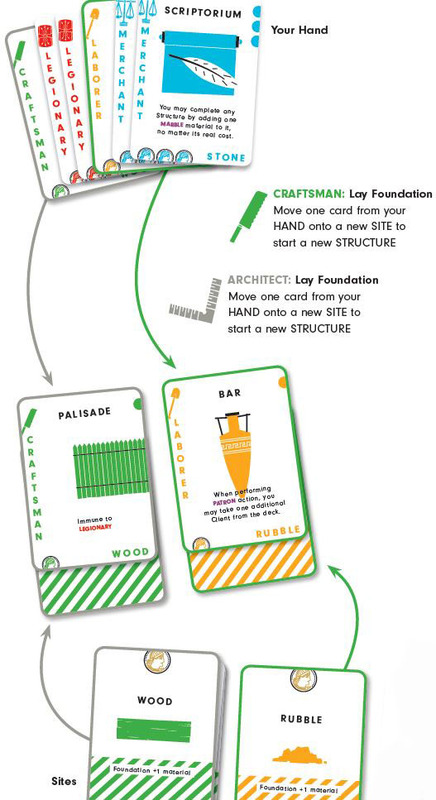 Start by explaining the game concepts including the cards, the sections of the Camp as well as the Site / Foundation / Materials / Influence cycle of building buildings. 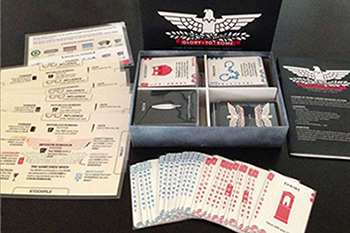 It can also help to play your first few turns face up so that new players can see the full game mechanics. Try to play all six Roles early in the game so they see what each action does. Place a Camp card face up in front of each player. Place the large 'Rome Demands' card in the middle of the playing surface. Shuffle the Order cards and deal each player five cards face down. Place the Jack cards in the middle of the playing surface in a pile. Create a stack of each Site card equal to the number of players in the game - these should be arranged so that you can easily see how many are left. Leave the unselected Sites in stacks beside these, upside-down. The upside- down Sites are Out of Town Sites. Deal one Order card face up into the Pool for each player. The player whose card comes first in the alphabet starts - deal extra cards into the Pool in order to break ties. Place the Leader card face-up in front of the player who is starting. Place all the face up Order cards in the middle of the playing surface beside the pile of Jacks - they are the starting Pool. Place the remaining Order cards face down beside the Pool to form the draw pile. 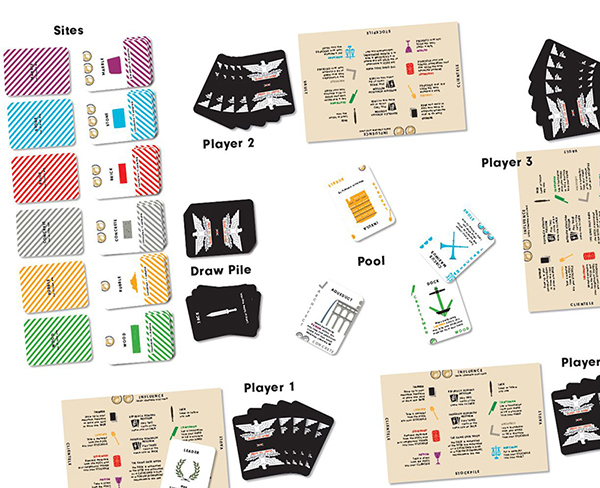 Training Game: To speed up the training game, use at most three of each Site card and remove half the draw pile from play. On each turn the player with the Leader card ('The Leader') decides what type of turn (Role) it is going to be, and then each other player decides whether to participate (Follow) or draw cards (Think). 'Think' and draw additional cards. In this case her turn ends immediately. 'Lead' by playing an Order card from her hand on top of her Camp. This determines the Role for all players for this turn. 'Think' and draw more cards (see below). 'Follow' by playing an Order card of the same Role as the Leader. After all players decide whether to follow or think, the Leader may perform one action for leading, plus an additional action for each Client she has of her chosen Role. In clockwise order, each other player now gets to perform one action if he chose to follow, plus an additional action for each Client he has of the chosen Role. Players who thought instead of following do still get to take actions for their Clients! Once all players have finished, move all Order cards played as Roles off the Camps into the Pool. The Leader now passes the Leader card to the player on her left and that player becomes Leader for the next turn. Jacks are wild cards. On your turn as Leader you may lead one as any Role except Thinker by playing it onto your Camp and announcing which Role the Jack is. You may also follow any Role with a Jack just as if it were a card of the type led. At the end of each turn, any Jacks played return to the Jacks pile beside the Pool. Jacks cannot be taken or played as Materials or Clients. You may also lead or follow by playing any two Order cards of the same Role (color) as a Jack. You may play two cards of the Role you wish to play (e.g. playing two yellow cards as a Laborer) however you may not play two Jacks as a Jack. Take one Jack (if available). Draw as many Order cards from the draw pile as you need to fill to your hand refill size (normally five). Draw one additional Order card (if you are at or above your hand refill size). If you choose to draw Order cards then you must draw to hand refill size. You may not fill your hand partially. If on your turn as Leader you choose to Think instead of leading a Role card from your hand then the other players do not get to follow. When you are finished the turn ends and you pass the Leader card to the player on your left. Player 2 plays a Jack to follow Laborer. Player 3 chooses not to follow, and instead Thinks, immediately drawing Order cards to bring her hand up to 5. Player 4 also decides not to follow but already has 5 cards. He draws 1 more Order card, bringing his hand up to 6. Player 1 has a Laborer in his Clientele. He performs 2 Laborer actions - one for leading and one for his Client. Player 2 performs 1 Laborer action for following - he doesn't have a Laborer Client. Player 3 has 2 Laborers in her Clientele. She didn't follow but may perform 2 Laborer actions for her Clients. Player 4 didn't follow and doesn't have a Laborer Client, so he gets no actions. The yellow card Player 1 used to lead is placed in the Pool and Player 2's Jack is placed on the pile next to the Draw Pile. This turn is completed. Player 2 now becomes Leader for the next turn. You execute a Patron action by taking a card from the Pool and tucking it underneath the left edge of your Camp so only the Role name is showing. It is now a Client in your Clientele. Your total number of Clients is limited by your current Influence - you start the game with two Influence. Each of your Clients may perform its action in any turn when its Role is led - even if you decide to Think rather than follow. 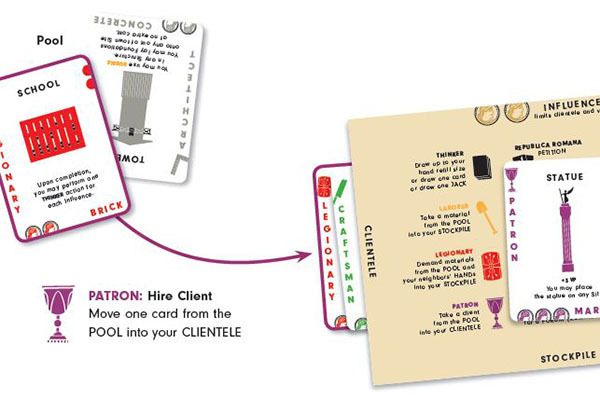 Example: If you have two Laborer Clients and another player leads with a Laborer card, you may either follow with a Laborer card and perform three Laborer actions or execute one Thinker action immediately and still perform two Laborer actions later in the turn. A new Client does not perform its action during the turn that it is hired - you must wait until the next turn in which its Role is led. You execute a Laborer Role by taking a card from the Pool (if available) and tucking it underneath your Camp on its bottom edge so that only the Material name is showing. The card is now a Material in your Stockpile. 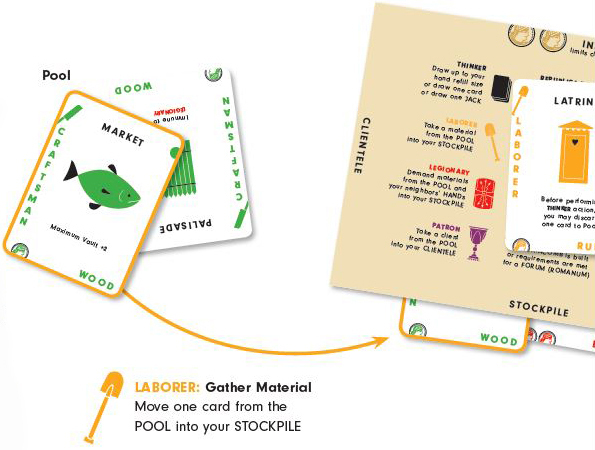 Players perform the Laborer action in turn clockwise around the table; if there are not enough cards in the Pool then players later in the turn order may be unable to take a card. Note that the cards players use to lead as or follow the Laborer Role are not yet in the Pool and may not be taken. You perform Architect and Craftsman actions in order to build Structures and restore glory to Rome. It usually takes several rounds to complete a Structure. You may work on several different Structures at once, even on the same turn, however you do not gain the benefit of a Structure (increased Influence and its function) until it is completed. Perform one Architect or Craftsman action to place an Order card from your hand in front of you; it is the Foundation of the Structure you are starting. Take a Site card of the matching Material and tuck it underneath the bottom of the Foundation so that the diagonal construction stripes are showing. There is no Site of matching Material left. You already have a Foundation or Structure of the same name in play. You may lay a Foundation with the same name as an opponent's Foundation or Structure. The upside-down Sites are outside Rome. To lay a Foundation on an Out of Town Site, you must perform two consecutive Architect or Craftsman actions on the same turn. Without a Client of the matching Role, it is normally not possible to build outside of town. To add Material into a Structure, it must already have a Site and Foundation - although these may be provided by laying a Foundation on the same turn (see above). The Material used to build the Structure must match the Material shown on the Foundation card (i.e. the Foundation and Material cards must be the same color). 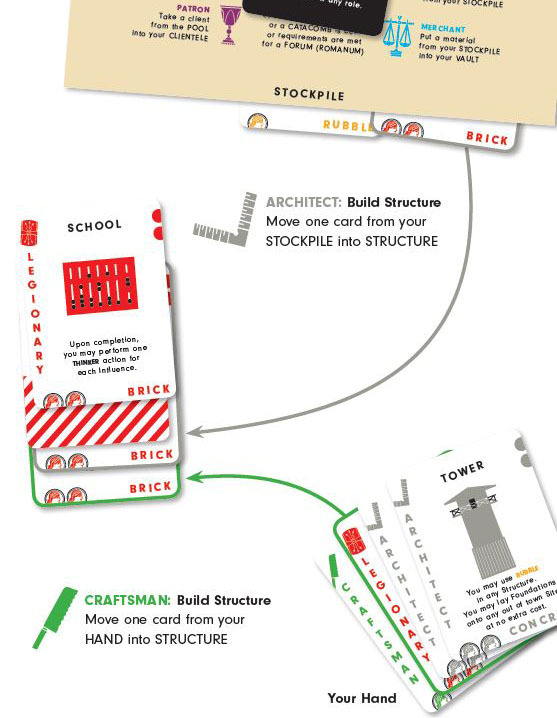 To perform an Architect action, take a matching Material from your Stockpile and tuck it underneath the bottom of the bottom card underneath the Foundation so that the Material type is showing. To perform a Craftsman action, take a matching Material from your hand and tuck it underneath the bottom of the bottom card underneath the Foundation so that the Material type is showing. Completing a Structure requires a Foundation, a Site and one, two, or three additional Material cards depending upon the Value on the Foundation card. When you complete a Structure, take its Site card and tuck it underneath the top edge of your Camp so that the gold coins are showing. The Materials stay with the completed Structure. Your Influence increases by the value (number of gold coins) of the completed Site. This allows you to hire more Clients and store more Materials in your Vault. In addition, you gain the benefit of the Structure's Function. Both of these effects happen immediately - you may benefit from them on the turn the Structure is completed! Training Game: Ignore the special Function available for completing the Structure - you still gain the additional Influence. Turn over an Order card (not a Jack) in your hand, and then place your entire hand on the oversized 'Rome Demands' Card so that this Material is showing. If there are card(s) of the same color in the Pool then you may immediately take one and place it in your stockpile. If your neighbors (the players sitting left and right of you) have one or more cards of the color you are demanding in their hand then they must give one to you - again you place it into your stockpile. If either neighbor does not have a matching card she says 'Glory to Rome! ', and you get nothing from that player. Once you have completed the action pick up your hand and turn over the Order card you revealed so that it is no longer showing -- the card you use to demand Materials never leaves your hand. In a two-player game, your opponent is your only neighbor. If you perform more than one Legionary action in the same turn you must reveal all Materials you are demanding at once. You may ask for any combination of Materials in your hand, including multiples of the same Material if you have duplicate cards. If a neighbor has part of what you are demanding, he gives up as much as he has. If you have fewer Order cards left in your hand than the Legionary actions you have available the extra actions are lost. A player must say how many cards he has if asked. You perform a Merchant action by taking one Material card from your Stockpile and tucking it face-down underneath the right edge of your Camp - into your Vault. The Values of cards in your Vault count as Victory Points at the end of the game. The number of cards in your Vault is public information, as is the identity of a card in your Vault on the turn that you put it in; however, after the turn that it is put in no player may inspect the identity of a card in your Vault - not even you! Space in your Vault is limited by your current Influence. You start the game with two Influence. 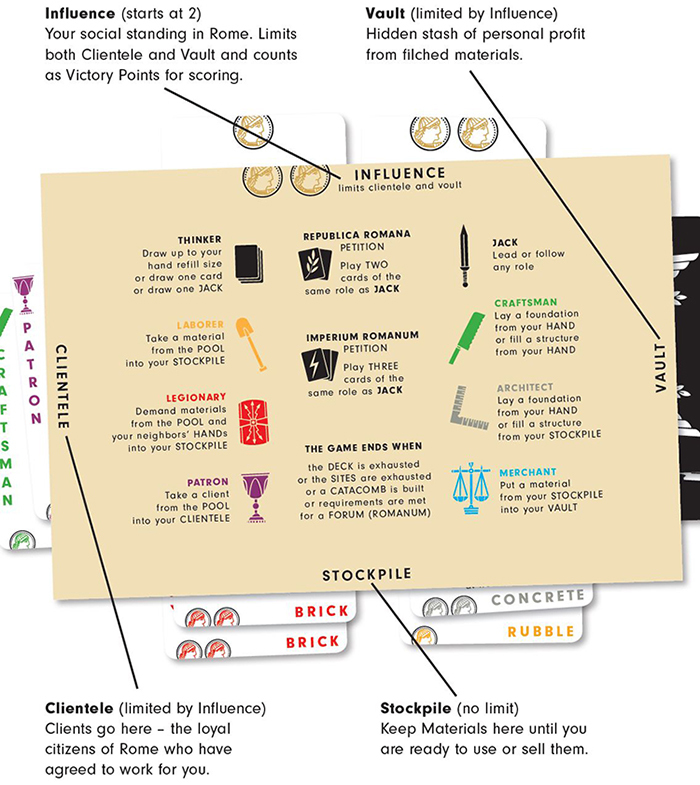 At the end of the game all players uncover their Vaults and the three-point bonus card is awarded for each Material to the player with most of that Material in his Vault. If there is a tie for a Material, that bonus card is not granted. The draw deck runs out (you may count it). A player lays a Foundation which claims the last Site card (see above) that is not Out of Town. This Structure can never be finished. Any player has a completed Forum Romanum Structure and at least one of each Client type in Clientele and one Material of each type in Stockpile. All other players agree to 'surrender' to a player for any reason (e.g. bribery, intimidation, etc).. The game ends immediately - players do not continue with the current turn and do not perform any more actions. Training Game: Since building functions are not in effect, the Catacomb and Forum Romanum end conditions do not apply. In the event of a Forum Romanum or 'surrender' victory that player wins - there is no need to score Victory Points. If you have completed Structures whose Functions grant Victory Points (e.g. Statue, Wall) determine the amounts granted and add them to your Victory Point score. If there is a tie, the tying player with the most cards in his hand wins.